Hate your partial denture? Our dentist in Forest Hills, Queens can replace it with dental implants that will look, feel, and function like natural teeth, and never have to be taken out. In cases where multiple teeth have been lost, implants are an ideal way to replace teeth without the drawbacks of traditional bridges or partial dentures. In this case, the patient had lost his lower front six teeth to gum disease. 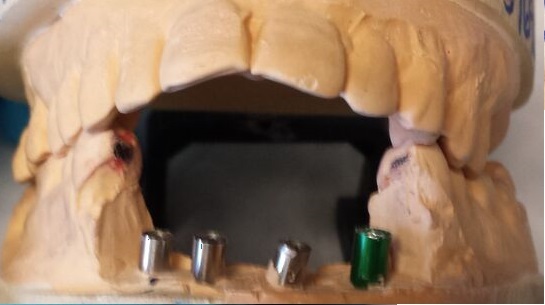 The model of his teeth below shows the positions of the implants that would support his final bridge. By replacing the teeth with a porcelain covered esthetic bridge, the patient was able to smile again. This photo from the patient's next checkup appointment shows why implants can be better than the real thing: porcelain doesn't stain or decay. That's a major advantage when patients are at severe risk for future cavities. The natural teeth stained and decayed, but the implant bridge looks as good as when it was placed. Our friend is smiling again for the first time in years.. If an implant replacement of multiple teeth interests you, Call us today at (718) 268-1561, or request a consultation.